I wrote this in 2007 while still a military analyst at NBC News. I think it still holds true today. Lt. Gen. Ed Soriano, left, presents Jessica Hebert, sister of Spc. Justin Hebert who was killed in Kirkuk, Iraq, with an American flag during his military funeral (AP Photo/The Herald, Meggan Booker). Comment - Ed Soriano and I served together in Desert Storm - this must be his hardest duty. Memorial Day weekend – most people associate that with the start of the “summer driving season.” The constant news coverage of record high gasoline prices tends to overshadow the real meaning of the holiday. It’s not about driving or shopping – it’s about remembering the men and women who died while in military service. It is important that we not forget the reason for this holiday – we are at war and lose some our finest young men and women every day. Yes, we are at war. No one knows this more than the families of those who have fallen on battlefields far from home with names most of us cannot pronounce. Unlike most of the wars America has fought in the past, we are fighting with an all volunteer force – there has been no draft since 1973. Less than one-half of one percent of our people will serve in uniform (in World War II, it was over 12 percent) at any one time. In the draft era, a much higher percent of the population entered the service, creating a large pool of veterans. Veterans understand the unique demands of military service, the separation from loved ones, the dangers of combat. With far fewer veterans or a veteran in the family, community and government, it is easy to lose sight of the demands military service requires of our men and women in uniform – all volunteers – and to forget too quickly those who have made the ultimate sacrifice. Sometimes one could get the feeling that foreign countries – especially those that have been liberated by American forces – pay more tribute to our fallen troops than we do. I will never forget standing in a church in rural France – not a fancy cathedral, not a tourist spot, nothing architecturally significant, just a village church. I would not have paid much attention until I spotted a well-maintained corner with a small American flag and a plaque. Over the years, over a million Americans have died in military service. Each fallen warrior is afforded a military funeral. 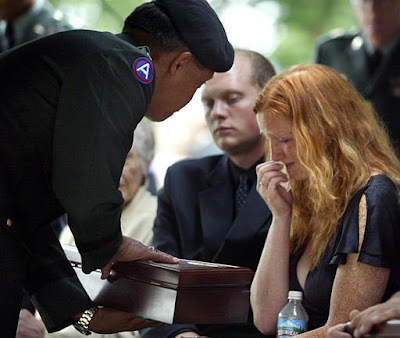 Military funerals symbolize respect for the fallen and their families. Anyone who has attended a military funeral will never forget it – the flag on the coffin, the honor guard in full dress uniform, the crack of the rifles firing three volleys as Taps is played on the bugle, the snap of the flag as it is folded into the familiar triangle of blue, the reverence of fellow warriors.